1. 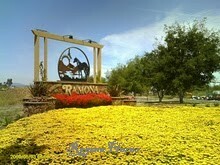 The Beautiful location: Ramona is located in San Diego County, known as the Valley of the Sun. Located above the “fog line” and below the “snow line”. This is my top reason to live here because every day I am surrounded by beautiful Mountains. Away from the heavy traffic of the city, it’s a place to go home and relax in your quiet, mountainous surroundings. 2. It is a great place to live: I have raised my kids here for nearly 10 years and am thankful they were able to grow up where they have places to roam. They can enjoy the outdoors, hiking, bike riding, golf, swimming, horse riding and more. Pretty much year round great weather too! 3. It’s an awesome community: True, we may not have any big shopping malls or many retail centers, but what we do have is a real sense of community and down home values that really matter. The sense of taking care of others in need. Having been through 2 fires here, I can tell you this is a town that helps each other in our time of need and cares about each other. Besides who has time to shop when you have running, hiking, swimming, horse riding and relaxing? 4. It’s Less Expensive: On average it is less expensive to buy a home in Ramona than Poway, Ranch Bernardo or areas closer to the freeways. You can get a lot more home for the money here. 5. Good Schools: See link below for all the Ramona Schools. As you can tell, I have enjoyed living in Ramona. Hope to see you here. If you have any questions about this area feel free to give me a call.